Photo by Louise Swartzwalder Robert Evans told Bellville Village Council members at this week’s meeting that he would be willing to fill the council’s vacant seat. BELLVILLE – Village council is looking for a new member. Jason Potes, owner of Stoodt’s Market, recently ended his service, saying he needed more time to devote to his business, his family and his “faith,” according to Mayor Teri Brenkus. A potential council member, Robert Evans, appeared before council to say he wished to be considered. Evans said he moved to Bellville at the urging of his wife. He works at a Columbus hospital, but has a degree in criminology. He said he thinks he could bring his understanding of how to work with people to a job on council. Council member Vic Swisher asked him what had drawn him to this area. Evans said the tradition is strong in Bellville. There is a “small town feel” and people “embrace it,” he said. He mentioned parades and the street fair. Council was given an update on work within the parks committee. A representative of a group that studies municipal park systems had visited with council. The village needs to consider whether it should drain a smaller pond at Palm Park. To dredge it would cost $50,000, he said. The village needs to find out if there is any “push-back” if it would wish to fill that pond in, he said. Swisher also said the school district has asked if the village would be interested in maintaining two new tennis courts if those could be built. There was an old agreement governing tennis court care, he said. Under that, the schools would build courts and the village would maintain them. Swisher said that topic needs to be revisited. Village administrator Larry Weirick said village workers are starting to deal with mosquito spraying, which is a new responsibility this year. Richland County had been doing the spraying. The problem is figuring out if the spraying techniques are effective, he said. People can set up traps to monitor the spraying, but that process means catches have to be sent away and it takes two weeks to get results. He demonstrated what he said was the best way to figure out effectiveness. He held out his arm. He said if “five are there” you can slap them, and it means it is time to spray again. Council member Josh Epperson, reporting on works of the cemetery committee, said a request has been submitted for a 5k run, which would go through the cemetery. This would occur on the last day of the Bellville Street Fair, he said. Village solicitor Sarah Mussman said the byways there are public roads. Brenkus said there had been some opposition in the past to similar requests. Work has been done on the depot area next to the bike trail on Bell Street. A ribbon cutting will be scheduled later to introduce people to improvements there. The village took down the ice skating rink in Central Park Wednesday. 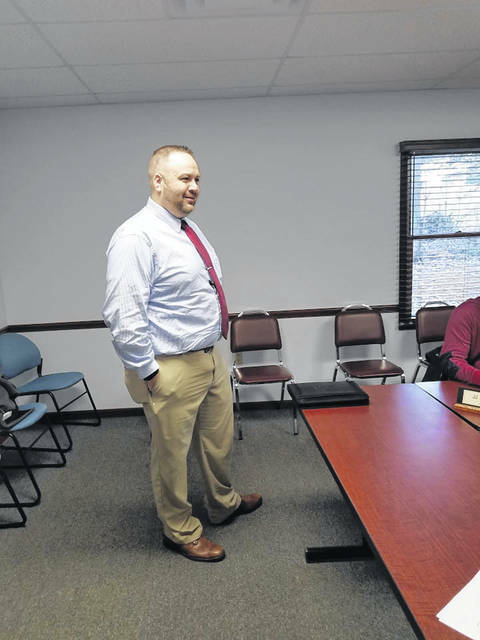 The planning commission for the village is going to consider a plan for expansion of Smith Hardware at its meeting March 25.
https://www.thebellvillestar.com/wp-content/uploads/sites/39/2019/03/web1_Robert-Evans.jpgPhoto by Louise Swartzwalder Robert Evans told Bellville Village Council members at this week’s meeting that he would be willing to fill the council’s vacant seat.